HALT THE MERGERS: Rep. Heidi Scheuermann, R-Stowe, presents two bills which would buy more time for the legality of Act 46 to get worked out in courts before forced school mergers would happen. 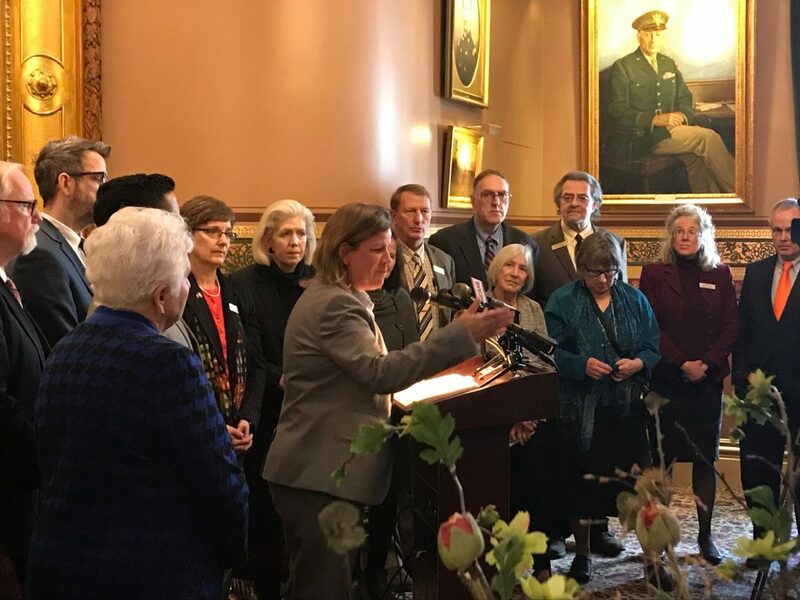 MONTPELIER — A group of lawmakers led by Rep. Heidi Scheuermann, R-Stowe, presented two bills this afternoon that would act as a moratorium on enforcement of Act 46 regarding forced school mergers. One bill would delay implementation of these mergers by one year, and another bill by summer 2020, or the duration of legal challenges. At least 20 school boards joined lawsuits in December opposing the forced mergers, primarily making the argument that the law is unconstitutional as they upend the will of elected school boards and their respective communities. These lawmakers argue that to merge schools, their budgets, transportation, and other resources only to see the mandate overturned in court could lead to challenging if not impossible breakups once the mergers are already in progress. Other states such as Maine which forced school mergers years ago were still struggling to sort out breakups even a decade later. Rep. Mike Mrowicki, D-Putney, started off the press conference. He shared some of the political upheavals that unsuccessful Act 46 projects created for his constituents. Scheuermann spoke next, her community has also been entangled in a forced merger scenario. The State Board of Education voted late last year to merge the Stowe and Elmore-Morristown districts despite in June then-interim Secretary of Education Heather Bouchey recommending against the merger. “Right now we are focused on getting this extension, that is where we are focused legislatively. We have some legal cases going on as you know, we have three different cases at this point going forward and we are therefore in [a state of limbo]. Rep. Mollie Burke, P-Brattleboro, spoke last. Diane Janukajtis, a member of the Stannard School Board, shared afterward how her district along with Woodbury, Hardwick, and Greensboro was told for years not to worry about a merger and then the State Board of Education changed its mind just months ago. She said her board and others made a tangible effort to investigate merger opportunities and came to the same conclusion. However, not being told to keep trying, they missed opportunities and incentives. She added that the Orleans Southwest Supervisory Union, which oversees these districts, indicated that the state instructed them not to help any school boards scheduled to merge to form their own budgets for this year. Windham School Board Chair Carolyn Partridge also spoke with True North. There already was a lawsuit taken to the Vermont Supreme Court by lawyer H. Brooke Paige, he challenged the law’s constitutionality and the state chose to challenge his standing in the case, which successfully got the case dismissed. Scheuermann, when asked by True North what implications this might have going forward, maintained that the cases going forward should have strong standing. “I think the cases are strong, and we’ll see what happens in the courts,” she said.